No new content, 4. January 2019 ob 18:53 Content on this website will no longer be updated from January 1 2019. 31. December 2018 ob 13:02 The air quality usually gets worse at the end of the year, which is a result of numerous fireworks. 31. December 2018 ob 12:26 When Slovenian television viewers turned on their TV sets to watch the main evening news on April 15, 1968, they noticed something very different. 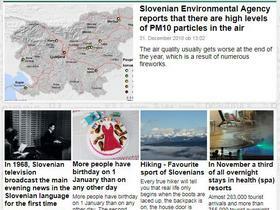 For the first time ever, the news was in Slovenian. 30. December 2018 ob 12:11 More people have birthday on 1 January than on any other day. The second highest number of children was born on 1 October. 30. December 2018 ob 10:21 Every true hiker will tell you that real life only begins when the boots are laced up, the backpack is on, the house door is locked and only mountains lie ahead. In November a third of all overnight stays in health (spa) resorts Almost 283,000 tourist arrivals and more than 755,000 tourist overnight stays were recorded in November 2018. Foreign tourists generated 63% of all tourist overnight stays. Will the new members of 2TDK management accelerate the 2nd rail track project? The management team of the second rail track project has been joined by new members – Dušan Zorko and Marko Brezigar, who will try to accelerate the project. A Drink from the Karst Plateau The windswept Karst Plateau is known for its stark beauty, but for the people who live there, the environment, with its hot summers and bitterly cold winter, is often unforgiving; even fresh water can be in short supply. Ljubljana emergency medical service received more than 900 speeding tickets this year No only fast drivers, stationary radars of the Ljubljana Municipal Police Department are chasing emergency medical service team on an urgent assignment. Hrovat to skip Semmering race Slovenian skier Meta Hrovat will not compete in the last two World Cup races of this calendar year, the giant slalom and the slalom in Semmering, Austria. Dončić: With LeBron? Maybe someday, we’ll see Luka Dončić needed only one more rebound on Thursday night to become the youngest player in the history of NBA League with a triple-double. A Villa among the Vineyards The Brda region, known for its orchards and its vineyard-covered hills, has recently emerged as one of Slovenia’s leading tourist attractions. The Cave That Became a Shelter Some of the worst fighting of World War I took place in the Slovenian Lands as troops vied for supremacy in the mountainous terrain that separates Central Europe from the Adriatic. Economic sentiment improved at the end of 2018 In December 2018 economic sentiment improved by 1.0 percentage point over the previous month. It is 12.3 percentage points above the long-term average. More about the economic sentiment in 2018 follows. Consumer sentiment is improving at the end of the year After a notable decrease in the middle of 2018, the consumer sentiment increased for the third consecutive month. It increased by 2 percentage points compared to the previous month and it is 16 percentage points above the long-term average.